HomeLibyan UprisingPicture taken near Benghazi raises question: is the Libyan No-Fly Zone active? 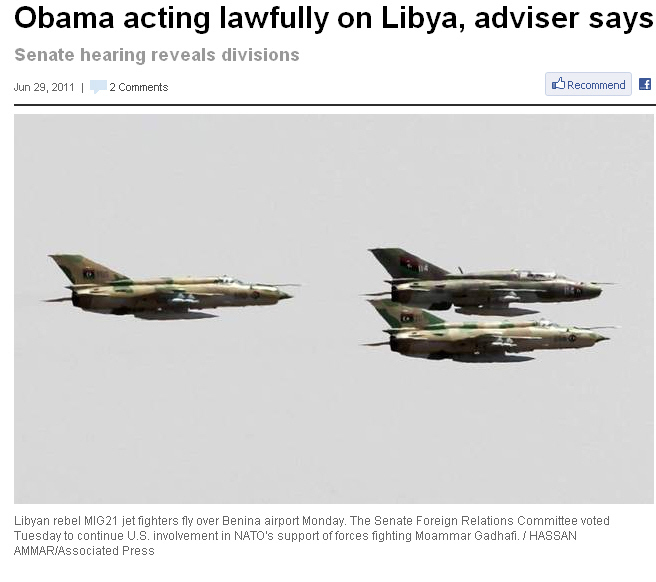 Thanks to a post on the ACIG.org forum, I found an article published on the Detroit Free Press titled “Obama acting lawfully on Libya, adviser says” that shows an extremely interesting picture of three FLAF (Free Libya Air Force) Mig-21s over Benina airport. The article was published on Jun. 29 and the picture was taken (according to the caption) on Jun.27. Armed planes wearing the FLAF flag and roundel aside, what’s really interesting about this picture is that it clearly shows a violation of the No-Fly Zone (NFZ) over Libya. In fact, as far as I know, the UNSCR established a ban on all flights in the airspace of the Libyan Arab Jamahiriya, rebel ones comprised. At 17.43 Al Jazeera English Libya Live Blog gave the news of a military helicopter with the Libyan rebel flag reportedly seen flying towards the fontline around Ajdabiya on Saturday despite a UN-imposed no-fly zone, showing also a nice picture by AFP of a Mi-24 clearly violating the NFZ (that, worth a remind, applies to both the rebel and governative planes). 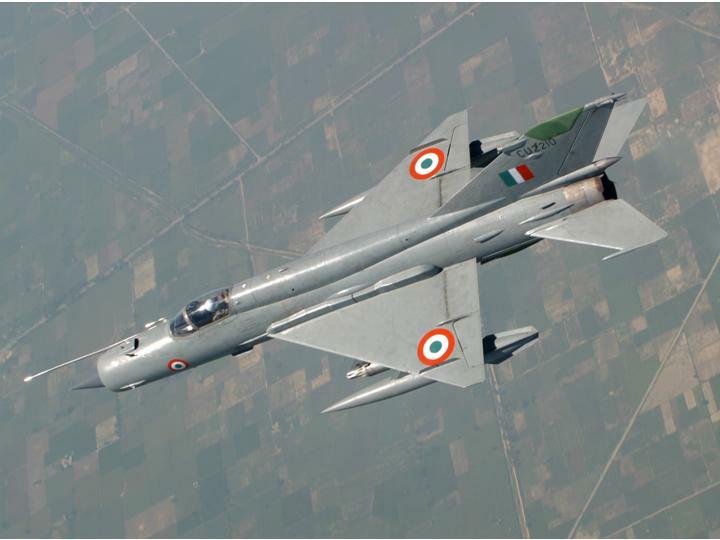 At 20.41, AJE reported of a Mig-23 flown by a rebel pilot, intercepted and forced to land back at Benina few minutes after take off. The aircraft, was immediately detected by a patrolling E-3 AWACS which directed one of the CAP flights to visually identify it. 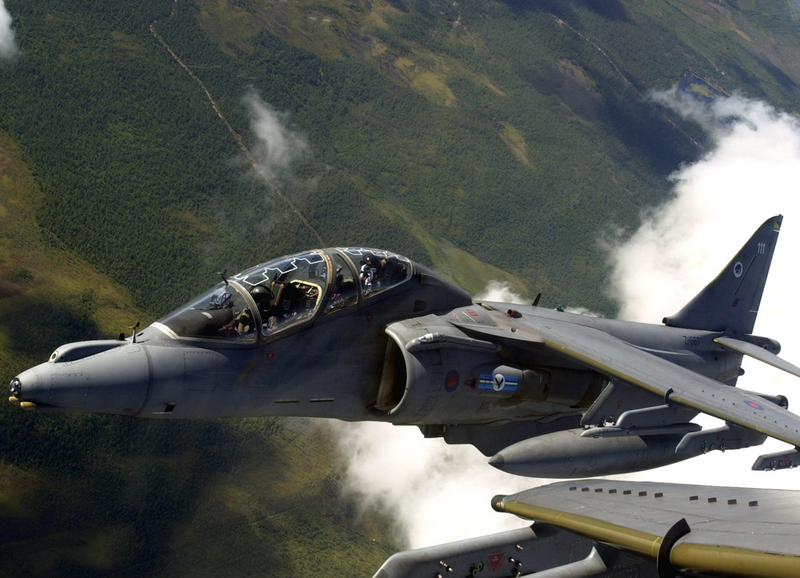 The Mig did not display any aggressive action and was simply led to land back at the airfield located to the south of Benghazi; the RoE usually require a prior visual contact with the “bogie” (in order to prevent friendly fire) but such violations could be extremely risky as “unannounced” rebel flights appearing on NATO’s radars could be easily mistaken for government planes and be shot down. The fact that they wear Free Libya flag is not enough to determine its intentions (what if the aircraft with the Free Libya Air Force roundel is flown by a pro-Gaddafi?). Many fighters are still enforcing the NFZ while E-3 AWACS are still patrolling the Libyan airspace (read this interesting article that explains also the role played by the asset in the air strikes). Although it is possible that the three Mig-21s were performing a local sortie or a sort of flypast over Benina, the above picture raise a series of questions: is a NFZ still active? 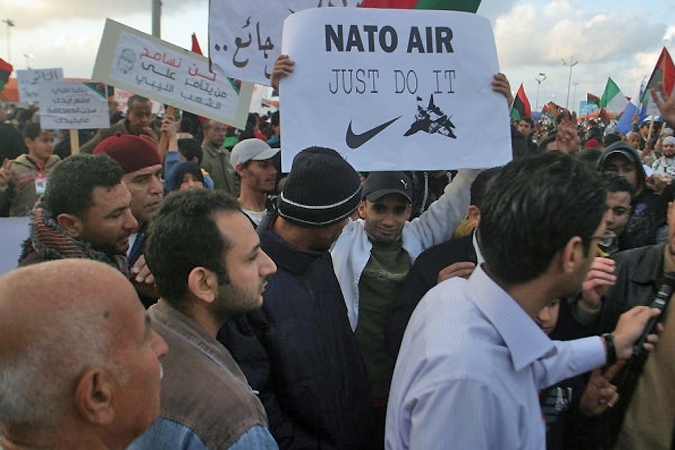 Is NATO able to prevent such violations? Did rebel planes receive a special authorization to perfom those flights?